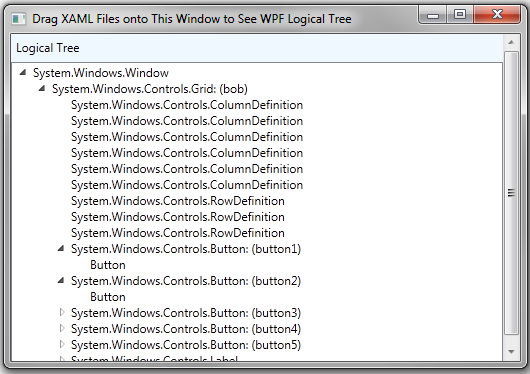 In WPF, a logical tree is just the hierarchy of elements that make up your user interface. If your user interface is defined in XAML, the logical tree is the set of elements from the XAML, organized into a tree based on their parent/child relationships. I wrote a little application that opens a specified .xaml file and then displays the logical tree from that .xaml file in a TreeView. You can find full source code on Codeplex, at wpflogicaltree.codeplex.com. 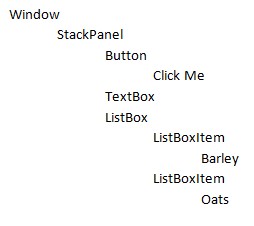 Title="Drag XAML Files onto This Window to See WPF Logical Tree" Height="350" Width="525" AllowDrop="True"
You use drag and drop to tell the application to load a .xaml file. The DragEnter event allows limiting the application to files being dropped. The Drop event picks up the name of the file being dropped and then calls a helper class to do the loading and initialization of the TreeView. Finally, the MyLogicalTreeHelper class includes the method LoadAndAddXAMLFile, which does the work of loading the file and building up the TreeView elements. ///   tree to a TreeView.